Regiment/Catrawd: 2nd Battalion South Wales Borderers. Service Rank and Number / Rheng gwasanaeth a rhif: Lance Corporal No. 39993. Military Cemetery/Memorial / Fynwent milwrol: Etaples Military Cemetery, Pas de Calais. Ref No Grave or Memorial / Rhif cyfeirnod bedd: Plot: XV111. Row: L. Grave: 19. Died of wounds, aged 27 years. George Percy Duffield was born in Rhyl, Flintshire on 26 October 1889. The 1911 Census shows that the family lived at 171 Wellington Road, Rhyl, Flintshire. The head of the family was Charles Duffield aged 63, a General Labourer. His wife Charlotte Duffield aged 54 and their son, George Percy Duffield aged 21, who was employed as a Grocer’s Assistant. Following the outbreak of war, George enlisted at The Drill Hall, Rhyl as Private No. 39257 Royal Welsh Fusiliers, but subsequently transferring to the 2nd Battalion South Wales Borderers. He suffered severe wounds from a shell and gas attack during the Battle of Arras and died shortly afterwards. During the First World War, the area around Etaples was the scene of immense concentrations of Commonwealth camps and hospitals. It was remote from attack and accessible by railway from both the northern or the southern battlefields. 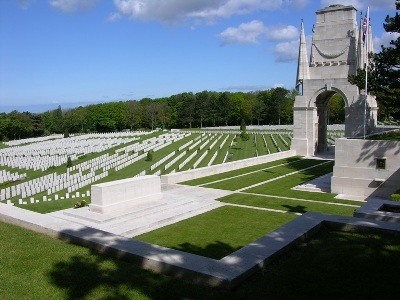 The cemetery contains 10, 771 commonwealth burials of the First World War, the earliest dating from May 1915. On 13 September 1917, a payment of £3.2s.2d was made by the War Office to Charlotte Duffield, this being monies owed to her son George. On 23 October 1919, a War Gratuity payment of £4.0s.0d was also made to her. He is also remembered on The North Wales Heroes Memorial Arch, Deiniol Road, Bangor, North Wales on a Remembrance Plaque at The Royal Alexandra Hospital, Marine Drive, Rhyl, Flintshire and at Maes Hyfryd Church Cemetery, Rhyl, Flintshire. There is a Flintshire Roll of Honour Card for George Percy Duffield at the County Archives Office, Hawarden, which was completed on 9 September 1919 by Charlotte Duffield.